To give you a helping hand when you are looking for a nanny, consider using a reputable nanny agency. Whether you are a busy working parent or you simply don’t know where to start with your search, an agency is there to take the pressure off you and give you a much needed, helping hand. Using a nanny agency, means that you can give them all your requirements and expectations and they will carry out the search on your behalf. They will ensure that the nannies have been pre-screened, with a wide range of checks and reference checks carried out to ensure a safe candidate with a high level of childcare experience is presented to you. Harmony at Home can help you to find your perfect child care solution. Send us your requirements today! What is the job description? Are you looking for a live in or live out nanny? Would it be a permanent or temporary position? Would it be part time or full time? Know your requirements before you start your search! Be clear on what you are looking for to ensure you don’t waste time. Are you looking for a sole charge nanny? Will there be a parent around whilst the Nanny is on duty or will she be in charge of looking after the children on her own? A Nanny will become a part of your family so it is important to ensure that they have suitable characteristics. Are you looking for someone who is sporty and energetic or arty and crafty? Look for a nanny who is going to fit in with your family and who has the same interests as your children. A nanny’s main role is to take care and look after your children. They will be responsible for the general care of your children, including carrying out all nursery duties (children’s washing, making sure the children’s bedrooms are kept tidy etc). However, you may decide that you are also need extra help with other household duties. If this is the case, consider hiring a nanny housekeeper to not only help with the care of your children, but to also help with household duties including washing, ironing, and running errands. A Nanny and a Nanny housekeeper, are 2 separate roles. Are you able to offer any benefits or entitlements to a Nanny? Are you able to offer the use of a car or a certain membership? If you are able to offer anything, this can work as a good enticement to nannies. It is important to think about what guidelines you will put in place for the Nanny. You will also need to think about terms of employment for your Nanny as this is a legal requirement. You will need to agree the terms of employment before both signing it off. When hiring a nanny, you become an employer so have a responsibility to pay TAX. As the employer, you will need to ensure deductions are made from the Nanny’s gross salary and are paid to the HMRC. This can be a rather daunting process so if you are in need of some much-needed guidance, NannyTax is there for you. An important factor to consider when hiring a Nanny is how much you are going to be able to pay. Have an idea in mind but be open to this figure changing. 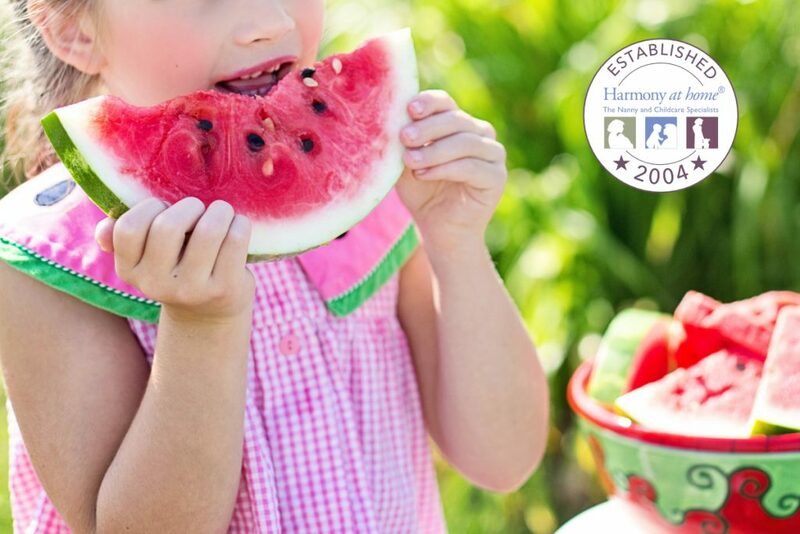 Harmony at Home Nanny Agency can help offer advice and support when it comes to Nanny salaries. This is an important question to consider. If you are looking for a Nanny, make sure you allow plenty of time for a Nanny Agency to find the perfect candidate. Finding the perfect Nanny is not going to happen overnight, so make sure you allow a sufficient amount of time to find the best Nanny you possibly can. Harmony at Home Children’s Eco Boutique – Christmas Gifts! Calling all parents! Christmas is just around the corner! Many children will soon be writing out their Christmas lists and letters to Father Christmas packed full of gifts and toys that they want for Christmas this year. For many, it may be too early to start to think about Christmas and buying presents. However, gifts and toys do not come cheap, with tech toys becoming one of the ever growing trend for children this year. With new technology being introduced into our daily lives, many children are wanting the latest gadgets on the market. However, with this being said, many children still love to receive toys and games to play with. Harmony at Home Children’s Eco Boutique has a fantastic selection for you. Discover our full range of toys and gifts for children of all ages HERE! This gorgeous fully painted and decorated wooden dolls house is set to make the ideal Christmas present for all children aged 3 years plus. Beautifully decorated in a stunning pastel colour scheme of white, mint and green, children will be sure to fall in love. This fantastic gift idea is set to captivate children’s imaginations. You can’t have an unfurnished dolls house, which is why this one also includes 32 pieces of wooden furniture including a welsh dresser, a table, chairs, bunk beds and a kitchen sink unit with an oven and hob. Crockery and toys are also included to allow children’s imaginations to really be creative. To make this gift extra special, Harmony at Home Children’s Eco Boutique can also personalise it for you with your child’s name. A fantastic wooden pirate ship with beautiful illustrations perfect for your little pirates aged 18months plus this Christmas. Let your children be the captain of their own pirate ship with this fun wooden boat with all the needed features included. 2 pirates, a fabric sail, a flag, a toy cannon, a turning helm, and sliding panels all allow your children to let their imaginations run wild and become their very own pirate. If your children love imaginative play, this is the ideal Christmas gift for them! This wooden shopping till encourages fun filled play times allowing children to pretend to be a shop owner or shopper. This wooden till comes with all the features of a real-life cash till. With a moving till drawer, buttons, a scanner, 4 wooden cards to be placed in the display, play money and a till roll to write on, children have the opportunity to have fun creating their very own shopping role play. Let your little ones become little farmers this Christmas with their very own wooden farm play house. This adorable farm house makes the perfect gift for children 18 months old plus. To accompany the farm house, 6 different farm animals to play with; a cow, goose, horse, rabbit, hen and a dog. This lovely farm house has 2 floors for the animals to explore or they can simply roam around outside. Let your children become their own farmer with this great toy! A brightly coloured ice cream van shape sorter will make the perfect Christmas gift for children aged 3 years plus. This fun toy can be driven around and also comes with 5 chunky wooden shapes which can fit through the various shape holes to keep children entertained. Once all the shapes have been sorted into the correct holes, the roof slides of to retrieve the shapes and the fun can start all over again. A beautifully designed music box that is perfect to allow your children to keep their ‘treasures’ safe with plenty of room to fit necklaces, bracelets and more. Suitable for all children aged 3 years plus and makes the ideal Christmas gift for young girls. This gorgeous song bird music box is decorated with bird and when opened, a bird can be found dancing to ‘Le temps des cerises’ by ‘Antoine Renard’. Hours of fun can be had this Christmas with this super exciting game suitable for ages 2 years plus. Watch 4 different coloured cars zoom down the track. Once one car reaches the bottom, start the race all over again. This wooden fire truck is perfect for your little fire fighters this Christmas. Decorated in a brightly coloured red, this wooden truck comes complete with 2 fire fighter figurines and has a moving ladder and basket. Lots of fun is waiting to be had with this truck! A beautiful wooden school bus makes the ideal Christmas gift for your little vehicle enthusiasts. Complete with 12 multi-coloured figurines that fit perfectly into the seats of the bus allowing children’s minds to be filled with creativity. Lots of fun is waiting to be had with this toy, playing and pretending to drive the bus. With a removable lid, children can to get into character and enjoy being in charge of their very own bus. This super colourful wooden Noah’s Ark makes the perfect Christmas present for all young children. This toy allows children to put their imagination to the test with 18 parts included as well as Noah and his wife. So, if you are looking for the perfect Christmas gift or are stuck for ideas, head to Harmony at Home Children’s Eco Boutique or check out their website for a spectacular range of gifts and toys. Halloween season is nearly upon us. Get ready for the coming festival with your children or charges with these Halloween themed ideas that are perfect for all ages. Children love to dress up and Halloween gives them the ideal opportunity to do so. With lots of costume ideas, it can be hard to choose just one. Discover a few ideas that are perfect for trick or treating or Halloween parties. Decorating – Have a go at decorating a pumpkin by using a selection of paints and materials. Get creative and see who can come up with the funkiest design. Carving – If you decide to have a pumpkin outside your house to entice in trick or treaters, get your children/ charges involved and see who can create the best design. Have a go at carving different shapes and faces and see whose is the scariest. Cooking – If your children/ charges love to bake, have a go at making delicious pumpkin soup, a pumpkin pie or some yummy muffins. With so many recipes to choose from, there are lots of ways to use up those leftover pumpkins. Decorations – a selection of materials or colouring tools to decorate with when the paint has dried. Wait to dry and decorate. All you will need for this easy, fun craft is a couple of satsumas or munchkin pumpkins and some permanent markers or googly eyes depending on preference. Have a go using different colour pens and creating different designs. All you need to do to create this simple craft is grab some card, cut in into A5 size and wrap it. Make sure you secure with some sellotape. All bats need wings, so once you have created the body, add a pair of wings and decorate as you please. Draw on some features and use pipe cleaners for the ears and feet! To create this creepy craft, simply cut away the outside of a paper plate. You can either choose to paint this black or cut out a piece of card to stick over the top. Once you have you body, don’t forget about the legs. Spiders have 8 legs and pipe cleaners work perfectly. Secure them down with some sticky tape and add some creepy eyes. You may decide to create a small hole at the top of your spider to attach some string. 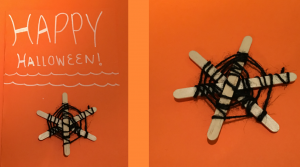 This is a fun way of bringing your spider to life! Black string – have a go at using different colours to create different effects. Every spider has a web! Have a go at creating your own one. All you have to do is stick together 3 lolly pop sticks in a ‘wheel shape’ manner. Once you have secured these down, grab some string and start wrapping it around! Once you have finished wrapping, secure down with a sticky dot or some tape. 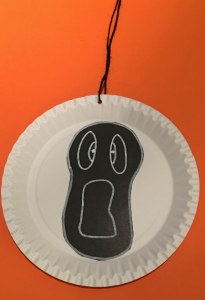 If you have extra paper plates lying around, why not create a ghost out of one. Simply grab some black card and cut out a ‘ghost like’ template and assemble to the plate. Decorate by adding different materials or colour in using a selection of different colours. Lots of fun and creation to be had! To bring your ghost to life, create a small hole at the top and thread through some sting. Whatever your plans are this Halloween, have fun and enjoy getting creative making a variety of different art and crafts! Christmas is coming! Nannies be prepared with our quick guide. The festive season is nearly upon us. Don’t let your children or charges forget to write their letter to Father Christmas and his Elves to inform them of what they would like to receive for Christmas this year. Nannies and parents, if you are looking for the perfect activity to do with your charges after school, have a go at writing a letter to Father Christmas. Christmas is a very busy time for Santa and his Elves. He needs plenty of time to get gifts sorted and wrapped and make sure his sleigh is prepared for the long journey ahead. Not only has he got to get all of this sorted, he will be busy replying to all letters he receives. So, make sure your child or charge sends theirs in by Friday 8th December 2017, to receive a reply don’t forget to include your name and address! If your child or charge has already sent off this years Christmas list, or is perhaps too young to write a letter to Santa, fear not! 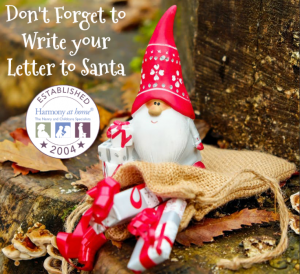 You can arrange for them to receive their very own letter from Santa! Have your child or charge receive a letter from Father Christmas by creating one via the NSPCC. You can order a letter and choose from a number of different templates, just by making a small donation to a worthy cause. There are a number of different templates to choose from depending on the age of your child or charge. Once you have selected your template, have fun personalising your letter to make it special. This is a lovely way for children to receive their very own letter from Santa. You may decide that you would like to create your own letter on behalf of Father Christmas. Have a go at designing and personalising your own letter for your child or charge. Don’t forget to leave out those ‘special treats’ for Father Christmas and a couple of carrots for his reindeers! I have been told that Santa is quite partial to a mince pie or two.